Bible Stories for Adults, James Morrow, Mariner Books, 1996, ISBN 9780156002448, 256pp. “Bible Stories for Adults, No. 17: The Deluge”–Not for the squeamish, this retelling of the Flood touches on some of Morrow’s recurring themes. Why is it murder when humans kill, but not when God kills? What is the value of life? How should we live our lives? I did not find this as disgusting as when I first read it, but I’m also 10 years older. “Daughter Earth”–I’ve written about this story before, and it was a pleasure to reread it. It is one of my favorites–a strange metaphorical tale that has character, humor, and a biosphere. This is the kind of story I want to write when I grow up. “Known But to God and Wilbur Hines”–Well researched tale of World War I and how war is hell. It is okay, but we have seen the sentiment elsewhere, and, while the details are sharp and fresh, the actual plot and manner are a tad warmed over. “Bible Stories for Adults, No. 20: The Tower”–I like this one a lot better than “The Deluge,” possibly because of the great humor inherent in a story narrated by God himself. Morrow has a real gift for merging humor into his satire, and this is a prime example. The story itself, with its criticism of Donald Trump and the hubris of the well-off, and its method of turning the tables on the idea of Babel, is just marvelous. “Spelling God with the Wrong Blocks”–This is a fabulous story. I finished this and, as with “Daughter Earth,” thought, “This is the kind of thing that I try to write. A story that transposes one set of beliefs into the reference frame of another set of beliefs to put serious question marks into both absolutes.” In this one, natural selection is seen as the “correct” and holy interpretation of evolution, and when the science missionaries try to convince the planet of androids that instead they were actually the result of special creation, things don’t turn out so well. God, what a funny, but not so funny, story. Check double plus, highly recommended, in my top 20. “Bible Stories for Adults, No. 31: The Covenant”–Like “Spelling God…” this drops us into a apotheosis wherein what we find normal is switched. Instead of having Moses’ law for over 2,000 years, this world has had to go without it, instead preserving the shattered bits of clay from Mt. Sinai. The purpose of the computer they build is to put the tablets together again, to reveal the holy word. But is it worth it? Great social commentary. Question: What is the purpose of the numbers to these bible stores for adults? In this collection, there are only four, but the last is numbered 46. Are there 42 more that Morrow has not published? “Abe Lincoln in McDonald’s”–A little like the last story except the strange twist of having a very real Abe Lincoln in the future is almost too bizarre for words. The concept of slavery and society is always good for another story. “The Confessions of Ebeneezer Scrooge”–Similar in style and substance to the Bible Stories, at least in that it picks grits with a story that ostensibly provides for modern morals. Morrow feels that greed shouldn’t get off with just providing a turkey at Christmastime. “Bible Stories for Adults, No. 46: The Soap Opera”–An examination of God’s role in the life of Job. I’m reminded of XTC’s “Dear God,” and the line about how God has a lot of questions to answer about suffering. That’s a great thing about the Bible Stories–the God of the Old Testament was so capricious that moving his actions into modern times make him look truly ridiculous. 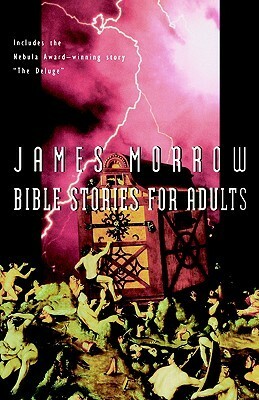 I was thinking that Morrow needs to tackle a New Testament story, but I guess that is what Only Begotten Daughter was about. “Diary of a Mad Diety”–Great concept for a story–a man with the most extreme multiple personality disorder. And I liked several parts it this, but the latter third just did not seem. to match the inventiveness of the earlier parts. “Arms and the Woman”–This is an example of the Iliad for Adults. What happens when Helen decides that she is not worth a war, a la Shaw. Nice idea, and the best part is the heroes over the truce table talking about how this is the war to make all war seem rational.